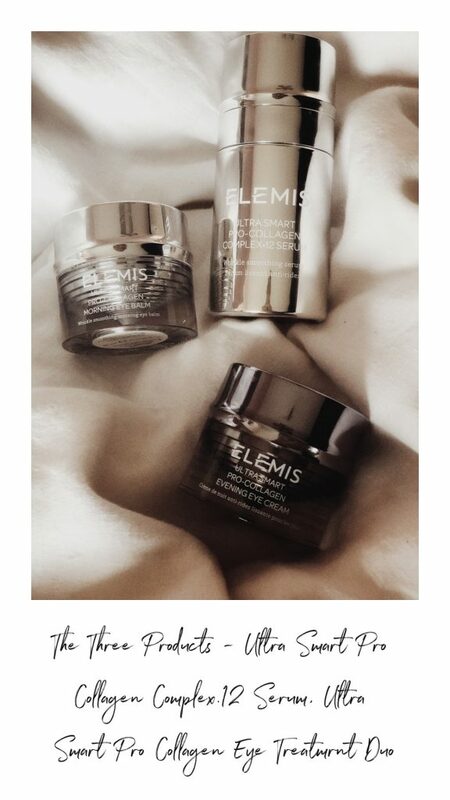 I’m very excited to be collaborating with Elemis this month, trialling their brand new Ultra Smart Pro-Collagen Range. 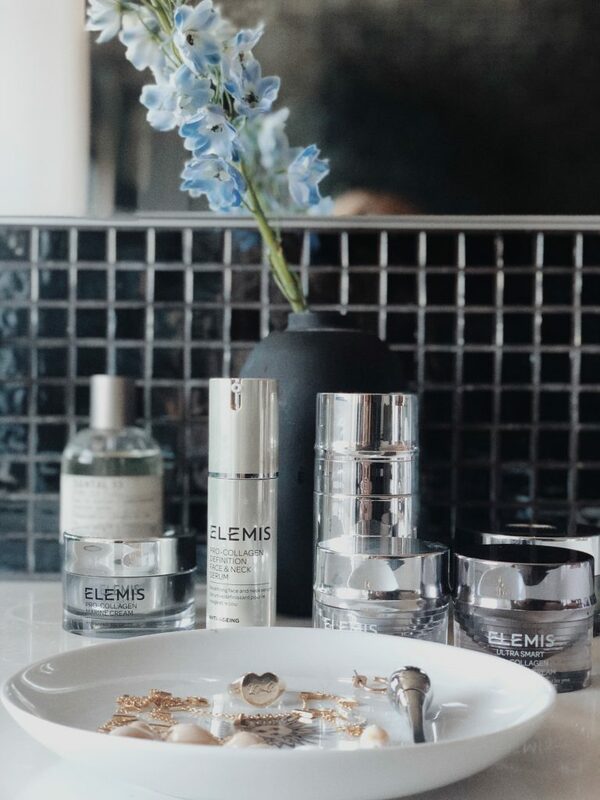 I fell in love with the Pro- Collagen Marine Cream after selecting Elemis products as part of my QVC partnership last year and this new intelligent range has been engineered to mimic the resilient appearance of younger skin. I am turning 42 this year, and while I like to think that I have done an okay job of caring for my skin over the years, none of us are immune to the inevitable signs of ageing. So many things cause our skin to age. Some things we can’t do anything about (the natural ageing process, inevitable ‘life stress’ and genetics) but other things we can influence (such as exposure to the sun, pollution, smoking and alcohol and how we take care of our skin.) 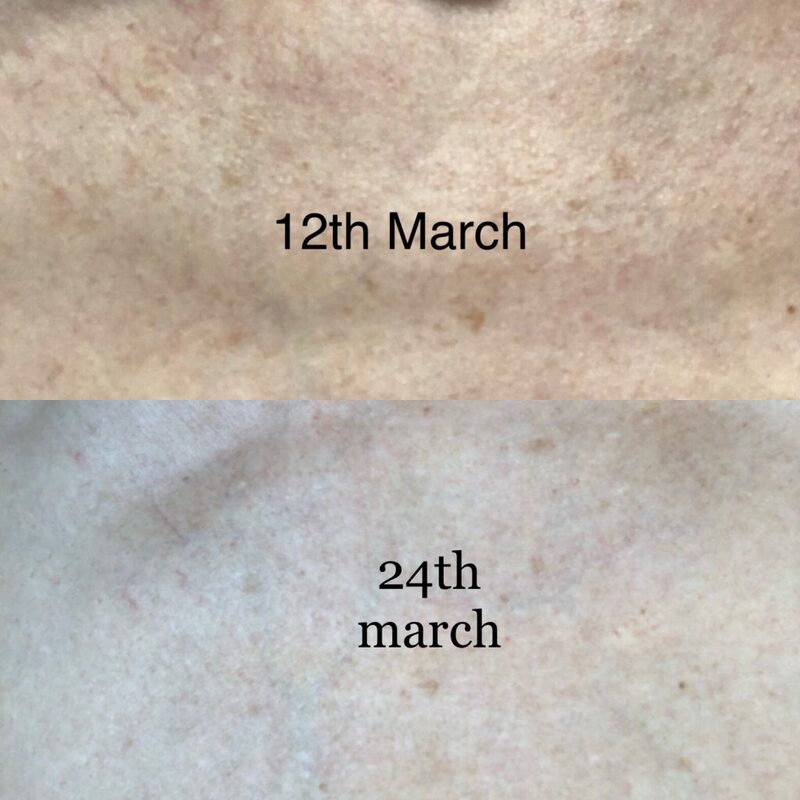 I have been very good with applying daily SPF in my twenties and thirties, but I did grow up in South Africa and let’s just say sun-cream wasn’t a high priority up until the age of 20 when I left for the UK, so I do have some sun damage and pigmentation. I have never smoked and only really drink alcohol on the odd occasion, so I think that’s helped a bit, but I have definitely lost the plumpness and volume in my face over the years and the fine lines are starting to show. So of course I jumped at the chance to try a powerful and clinically proven anti-ageing formula, Elemis new Ultra Smart Pro-Collagen Range. ELEMIS has developed high performance formulas by harnessing a diverse network of specialised algae in combination with targeted delivery systems that transport potent actives. It is a clinically proven solution to help improve the look of deep set lines, firmness and elasticity in 28 days. It’s been 20 days since I started using the products and the fine lines around my eyes are less visible and my skin looks a little plumper. Overall my skin seems to have a better texture and my pores appear to be less noticeable. I haven’t experienced any dryness since using this product, which is rare for me, as my skin tends to get quite dehydrated at times. I feel I should mention the cost of the product. Yes it’s a high price point, but this is a serum for those who are looking to invest in their skincare. I would also say that a little goes a long way and the pump dispenser means that there is no waste and you only need one or two pumps. I have been using it after cleansing and before applying my moisturiser and SPF both morning and evening. ULTRA SMART Algae Complex, rich in micro and macro algae, helps to promote, protect and preserve the appearance of the skin, restoring vital luminosity. 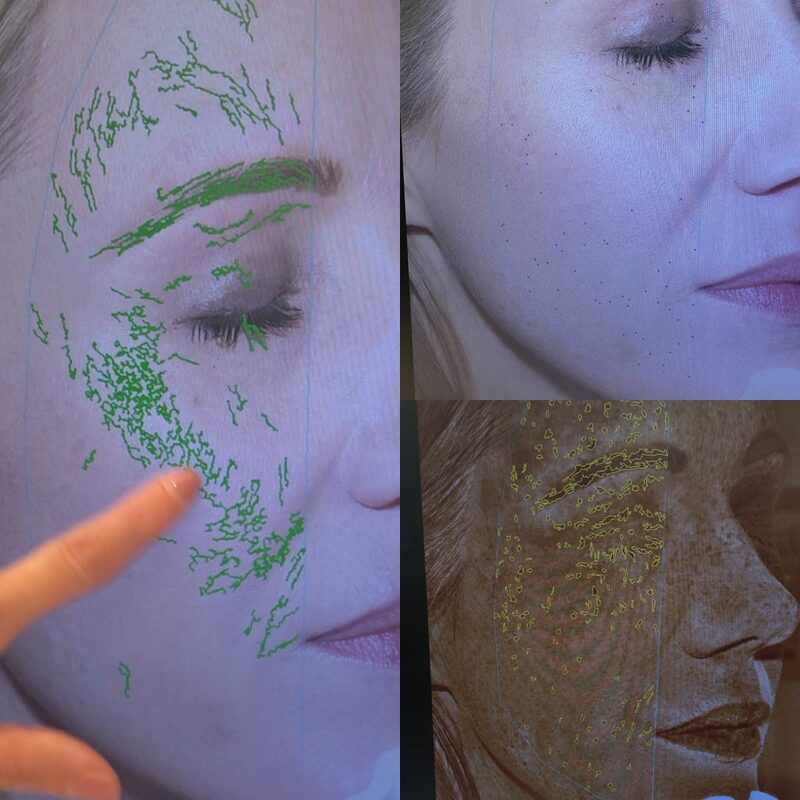 ULTRA SMART Drone Peptide Technology cleverly targets specific areas of the skin to help deliver a boost of Hyaluronic Acid without distraction. The skin around the eye area is thinner and more delicate than the rest of your face. 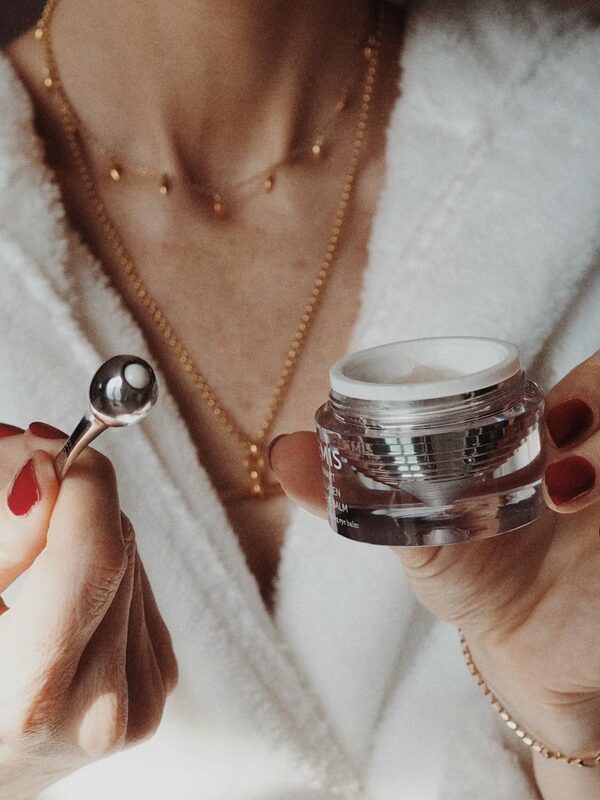 This duo provides two targeted treatments: a lightweight, cooling balm for day that helps de-puff and tighten, and a decadent cream for evening that delivers the intense moisture your eye area needs while you sleep. The light texture of the morning balm creates a seal that layers beautifully under your make‐up. The duo comes with a little eye tool (pictured below) to massage around the eyes using a little figure of eight motion. ULTRA SMART Line Fighting Complex helps reduce the appearance of deep set lines and wrinkles. MORNING EYE BALM: ULTRA SMART Triple Targeted Dermal Complex targets dark circles and reduces the appearance of under eye puffiness. I have really enjoyed using this little tool. It feels very cool and soothing on the eye area and it works the product into the skin. I have tried many eye creams in the past and many of them have given me weepy, stinging eyes after use, but I have not experienced any of this whilst using this duo. I have included a VERY close up image of the skin around my eyes, taken after 20 days of using the creams. For the avoidance of doubt I should add that I have never had any filler or botox around my eyes. Click here to find your local participating Elemis Counter. Green = Dehydration, Black dots are pores, Yellow is sun damage. A special mention must go to the Pro-Collagen Definition Face & Neck Serum which I have been using on my chest for the past month. I have always taken very good care of my face, but completely neglected my décolletage and it’s beginning to show. I have noticed a real improvement to the texture of the skin on my chest since using this product, it feels less bumpy and looks a little smoother. I recorded it after 12 days and I think there is a noticeable difference. If you do manage to book in for a facial or use any of the products, I would love to hear from you. Feedback is always useful both for me and for readers.